Home > Food & Medicines > Can Food and Drug Interactions Be Fatal? Medicines, as we all know, are supposed to make us better. The whole point in taking medicine is to cure yourself of whatever ailment you have. 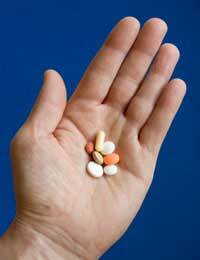 If you are in a lot of pain you can take painkillers to ease the pain and make you more comfortable. If you feel queasy you can take anti-sickness tablets to make you feel better. If you have a reaction to something then there is medication available which can ease the reaction. Medication is there to help. However this is not always the case. In some cases medicines do not work as they were intended to. Sometimes medicines do not work because the patient’s body rejects them or have become immune to them. For example painkillers may not work to ease the pain if you have taken them regularly. One your body is used to the drug it may not feel its affects much. If this is the case the patient may have to try a different type of painkiller in order to feel some affects. Sometimes the medication works but does not do enough. For example, a cancer patient may receive chemotherapy but it may not be able to fight off the disease. The chemotherapy may do enough to ease the illness or prolong the patients life but it may not be able to get rid of the illness altogether. In other cases though taking medicine not only does not work but can also have the adverse effect to the one desired – that is the medicine may make the patient more ill than they were before taking it! Some drugs react badly with other drugs or foods and this can cause a negative reaction for the patient. This reaction can include rashes, nausea, skin irritation, headaches, dizziness and many other symptoms. It is recommended that if you experience any of these symptoms when taking your medicine you should consult your doctor immediately. He or she will be able to inform you of whether or not you should continue taking the drugs or not. He or she will also be able to tell you whether any foods you are eating may be causing the negative reaction. Can Drug and Food Interactions Be Fatal? Drug and food interactions can have more serious effects too though. In some cases drug and food reactions can cause serious illness. Sometimes drugs react so badly with other drugs that organs can fail or become very badly damaged. In some very extreme cases this can be fatal. This is not common though and only happens in extremely serious cases. If you think you are suffering a reaction from the food you are eating and the medication you are taking then you need to see your doctor straight away. Doctors try their best to make sure you are informed of any foods that could react with the drugs you are a given but as everybody is different sometimes reactions that are not known about may occur. Visit your doctor immediately if this is the case.